I chose to discuss Thomas Cole's The Four Elements because of its romantic style and also because it is conflicting. The painting is clearly romanticized because it represents all four of the elements. In the distance there is a rain storm and to the right what appears to be a forest fire. In the foreground is a lake and then, of course, there is the element of earth. The romanticism in this painting is further demonstrated not only by the four elements shown all at once, but by the paintings representation of America. To address my comment about the paintings conflicting quality, this painting creates a certain feel of serenity to me because of the hazy wilderness in the distance and because of the contrast of light and dark between the foreground and background. However, simultaneously, the painting also creates a feeling of chaos. 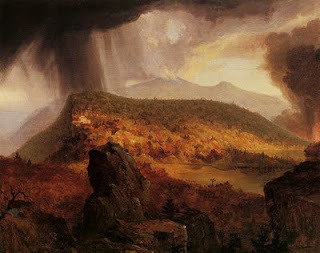 The use of dark colors in the foreground coupled with the forest fire and the heavy rain storm in the distance make it seem like there is too much going on in the painting. Good analysis, especially the second paragraph- in it you give evidence drawn from close looking at the painting to support your assertions about the sense of conflict apparent in the painting. You could take it one step further than Romanticism and think about the correlation between nationalism and national identity and this depiction of the nation.